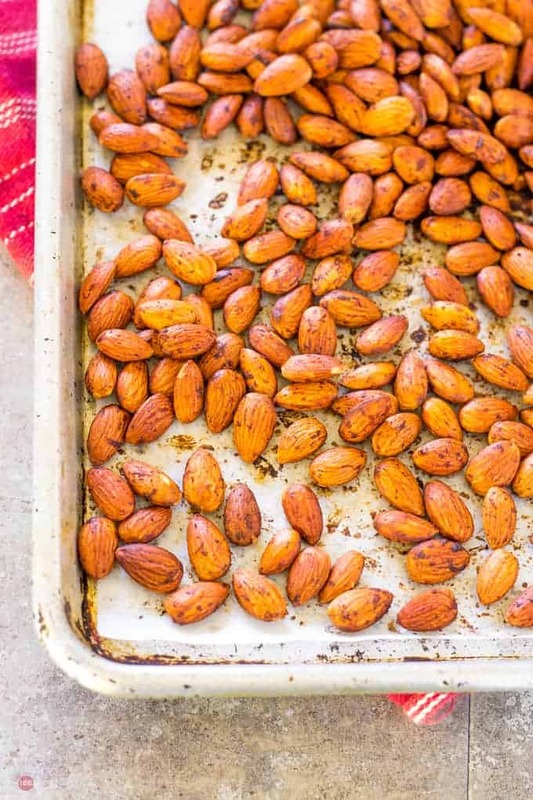 Almonds are a healthy snack and roasting them in bacon and tossing with smoked paprika elevates them. 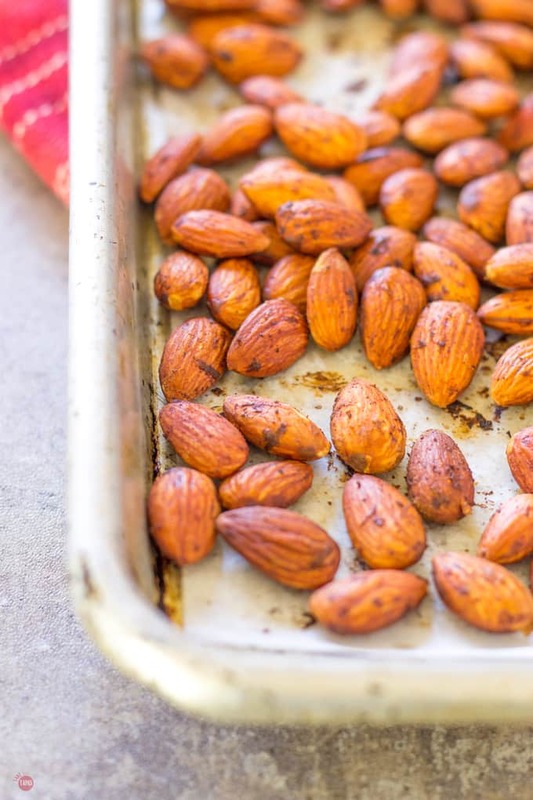 Add these smoked paprika almonds to your next cheese board or just eat by the handful! My summer tapas series continues with an easy snack, one that will tickle your tastebuds, and your nose. These smoked paprika almonds have an aroma that can’t be denied and a hint of bacon flavor that will make everyone drool. Do you have an enamel cup in the fridge full of bacon fat? You might not have this kitchen staple in your refrigerator, but you should! My mom and grandmother both had it, as well as their female relatives. I never understood why until I saw them scoop it out and use it to make green beans. Every time I make bacon for my kids, which is about 5 times a week, I bake it in the oven on a cooling rack to get it extra crispy. This allows the fat that is rendered off the strips to fall onto my baking sheet. I save this liquid gold and post it in a cup for other recipes. Try it in deviled eggs, drizzled over roasted cauliflower or Brussels sprouts, or even in your Bacon Salt Brownies! Enough talk of bacon let’s talk nuts! Almonds are such a great snack and I can’t talk about them when talking about tapas. So many tapas style meals have a small bowl of either olives, or nuts, or some kind of dried fruit. As a snack or on a cheese board, almonds make a great addition to any eating occasion. I wet your whistle with my recipes for Pan Con Tomate, Sweet Potato Patatas Bravas and gave you something to wash it down with my Kalimotxo. Time for a lighter snack before we power on with slightly heartier tapas soon to come. I adapted this recipe from my Lemon Thyme Almonds. The bones are the same with a Spanish twist of using smoked paprika for more depth of flavor. Smoked paprika is like the other variations only in Spain’s La Vera Region the chilies are harvested and dried over wood fires. This creates the smoky flavor while preserving the flavor of the chilies. Using smoked paprika is popular in Paella dishes and other dishes where you want a smoky layer of flavor. I bake these on my favorite baking sheets that I got from a restaurant supply store. They hold the heat perfectly and love them even more once I found these parchment baking sheets. In the past, I would buy the rolls of parchment only to get aggravated when it would roll up. These parchment sheets are already cut to the perfect size for my half sheet pans and lie flat! YIPEE! 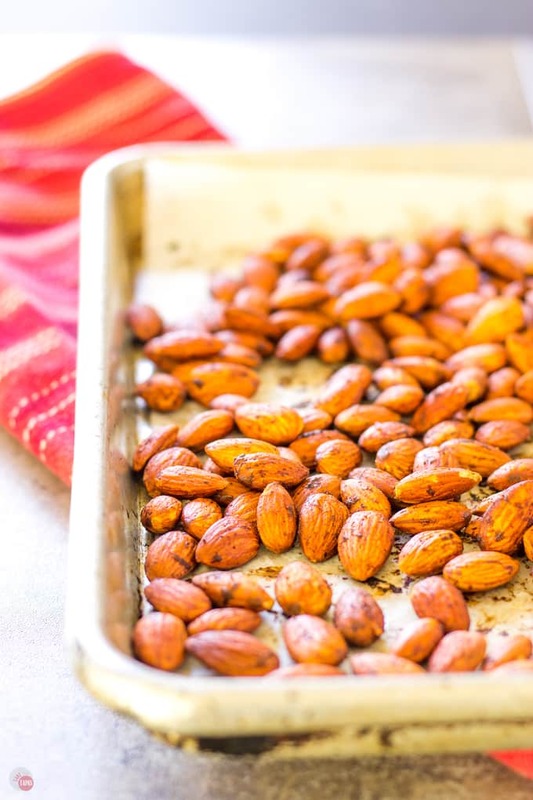 A simple roasting on these sheet pans give the almonds an even toasting and adding crunch to them! 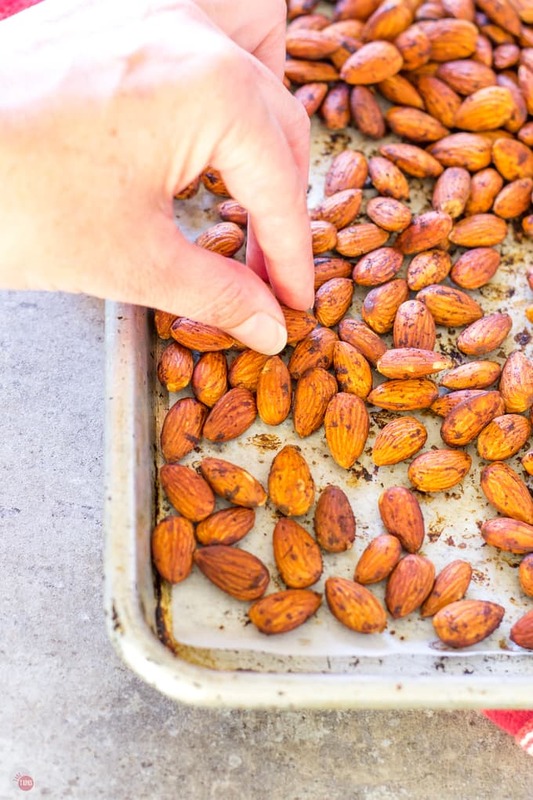 These almonds make a great snack, a tempting appetizer, and the perfect choice for cheese boards. I wouldn’t mind a bowl of them next to my desk while working either. When I make a batch I always send some to my hubby’s office so he can have something to snack on too. Warm bacon fat to liquid form. Toss almonds in bacon fat. Sprinkle with smoked paprika, lime juice, and salt. Spread on a parchment or foil-lined baking sheet. Bake for 30 minutes, stirring every 10 to keep the almonds from burning. When done, remove from oven and cool completely. Store in an air-tight container until ready to eat. Yumm… I bought a couple of bags of almonds a few weeks ago and have been looking for a savory recipe that hits the spot. I think I just did! The sounds of the bacon fat is just.. everything! Thanks for sharing this at Fiesta Friday, Jennifer. Now that sounds like a yummy snack! Thanks for sharing at the What’s for Dinner Link up! What a great snack! Hope you have a fantastic weekend and thanks so much for sharing your awesome post with us here at Full Plate Thursday. We hope to see you again real soon. YUM! Never underestimate the joy of the simpler tapas classics, like these beauties. Using bacon fat just puts them over the top. Alongside a glass of sangria and a dish of marinated olives? Perfection! Saw this on the DIY Mommy Link Party. Glad I did – this sounds yummy. I guess it will be my excuse to collect bacon fat. Thank you so much! I have a jar in my fridge all the time. When we moved I was sad to lose mine but the rate my kids eat bacon I was full again in no time. Definitely trying these! I am obsessed with smoked paprika, always sneaking in into recipes. And almonds with bacon and smoked paprika?? Yes please!